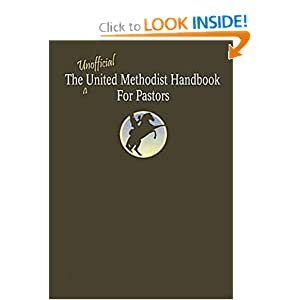 There is a ‘cute’ little book out there called “The Unofficial United Methodist Handbook for Pastors.” It has a bunch of short, direct, informative, funny, and yet serious vignettes into the everyday workings of being a UM Pastor. As I rearranged my book shelf I stumbled upon it, and like many of the books I tried to place in the correct shelf, I opened it up and started to read a little. The first vignette I came to that caught my eye was one titled How to Avoid Becoming the Pastor You Swore You’d Never Be and Become the Pastor You Always Wanted To Be. That caught my attention and as I read I felt some conviction. I’m a decade in and I have wondered this exact question. There have been times in this past year that I doubted my call, my self-knowledge, and who God really wants out of me. As I read through the five main points I felt some relief and thought I would share with the blogosphere. So here is post one of five and I hope they help someone out there dealing with the same stuff I have been through this year. “1. You are a preacher. (‘Preaching and teaching the Word of God…by leading persons to faith in Jesus Christ…). Speech is more than ‘mere words.’ Words have the power to bind and to free, to kill and to riase up. In fact, Paul matches ‘truthful speech’ with ‘the power of God.’ (2 Corinthians 6:7). dangerous stuff in the wrong hands: the word translated ‘power’ is dunamis. Recognize our work ‘dynamite’? Don’t – Let your walk stray so far from your talk that neither walk nor talk is recognizable. My Thoughts: There has been a rare moment in these last ten years where I have had the pleasure of actually participating in worship and was able to be preached too. There has been the rare occasion when I have been repulsed by what was being sad from behind the pulpit. The repulsion was the ‘show’ going on from behind it. During that time the preacher talked more about “I” or “me” than anything else. I constantly remind myself that when I preach it is not about me. One of the questions I ask my wife all the time is “do you think this illustration is okay?” I have found using personal stories help connect the congregation and myself. It is a good way to let them know more about me and my life experience but I always make sure the illustration points to God and not myself. If it points to myself it is usually in a self-deprecating fashion. I grew up a person who was scared to talk in front of people and hated to read in public. I ran hard from my calling to be behind the pulpit every week. Yet I have to remind myself it is also the place I feel most connected to God. I feel that way because I am not up there on my own volition. If I had my choice I would rather run the sound booth and be behind the scenes. But God has called me to stand behind the pulpit and I do as I am called. I love the quote from John Wesley, “plain truth for plain people.” That is my calling in a nutshell. ← Have We Moved Beyond Gender and Race?